Hi, I am interested in your 1957 Ford Thunderbird (stock #1236) listed on Autotrader for $54,950. I'd like to get more information about this vehicle and confirm its availability. 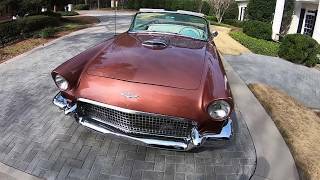 This Magnificent Example is finished in Stunning & Extremely Rare Thunderbird Bronze Code Q , with Beautiful White Interior, & Colonial White Hard Top. This Rare Estate Classic Underwent a comprehensive Frame Off restoration, including Exterior, Interior, Top, Brightwork, and Mechanics. Total Investment Exceeds $69K. This Magnificent and Extremely Rare Thunderbird, finished in Thunderbird Bronze, with White Interior & a Full Complement of Options, is an Absolute Pleasure to Drive. Many Baby Bird aficionados consider the 57 to be the Last, Most Beautiful, and Most Desirable of the Baby Birds of the era. It is as Straight as an Arrow and Absolutely Immaculate Throughout. It garners all the oohs and aahs any time out! !